February 9th is National Pizza Day. 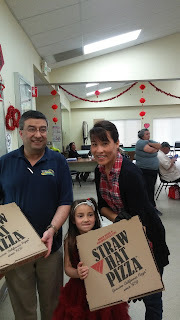 This year the Straw Hat Pizza in San Jose celebrated by participating in Slice Out Hunger's "Pizza Across America" event. (http://sliceouthunger.org/pizza-across-america) The event coordinated pizzerias across the U.S. to give to local soup kitchens. Suleman and Rhonda Chaudhary, the owners of the Straw Hat Pizza in San Jose, CA partnered with Loaves & Fishes Family Kitchen (https://www.loavesfishes.org) donating 10 pizzas. Loaves & Fishes has served the San Jose area for more than 37 years providing over half million meals each year. REWARD FOR RECOVERY OF STOLEN FOOD TRUCK!